My review in 3 words: Go see it. Ben Affleck partnered with Matt Damon to write the screenplay for the film Good Will Hunting for which the two of them won an Academy Award for Best Original Screenplay. This was the main launching point for the careers of these two wunderkind and we have seen both Ben and Matt rise to a status of secure, bankable stars in Hollywood. While Mr. Affleck has developed as a leading man, we must not forget his contributions in other areas of film making such as director and producer. In fact, it is here in the list of credits for the film The Town we get to see just how multi-talented this gentleman is. Not only did Affleck star in this film; he directed it and co-wrote the script. While that unto itself is an accomplishment, we must add the Rotten Tomatoes rating of 95% to make this an accomplishment of high quality. There can be no doubt that the name of this person will be of substantial importance in Hollywood for years to come. Many come to the table with a specific talent; not everybody can shine in several areas and rarely at the same time in the same movie. I leave the plot synopsis up to others like Wikipedia and Rotten Tomatoes, not wanting to give any spoiler alerts but will restrict myself to saying this film is about bank robbers. From there I will go on to compliment Affleck in bringing together some terrific action sequences and I will say that any action aficionados will not be disappointed. However let me underline that we do have a story and a good one at that. Great action and a story? Hey, what better combo could you ask for after shelling out your hard earned cash; great for guys and gals. Please note that the film which takes place in Charlestown, a neighbourhood of Boston makes some statements which are exaggerations of reality. 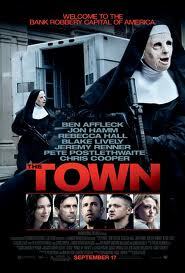 The movie starts by saying, "There are over 300 bank robberies in Boston every year. Most of these professionals live in a 1-square-mile neighborhood called Charlestown." This is apparently not at all true as numbers show only 23 robberies in the entire state of Massachusetts in the 1st quarter of 2010. That is... ah, slightly shy of 300 per year. Plus, while Charlestown has had a bit of a reputation back in history, it is nothing like that today. Let's chalk this up to poetic licence? As an aside, Affleck directed a crime drama called Gone Baby Gone (2007) which clocked in at Rotten Tomatoes with 94%. Saw the film; good movie; I see some consistency in the high quality of Affleck the director and I add that Affleck also co-wrote the screenplay for this film. Multi-talented. The Town had a budget of $37 million and right now, according to the latest numbers, has a world-wide gross of $77 million. There's nothing better than being good and turning a profit. I return to my original review in 3 words: Go see it.